I don’t understand why we have to do stuff in Cloud9 and then download it. Why are there so many folders? Think of Cloud9 as your laboratory. It’s a place where you can play with your site, make changes, and experiment. When you create a workspace in Cloud9, what you are doing is defining space on your domain that saves the files you are experimenting with. When you create a jekyll site in Cloud9, you are creating a folder within that experimental workspace to hold your site. However, that space is not public-facing. In our laboratory model, it has swipecard access, and you are the only person permitted. In order for other people (i.e. me, your classmates) to see your website, it has to be posted publicly. This is where File Manager comes in. File Manager is a way for you to see all of the files in your domain. It also contains a folder called public_html, which is where you put things that you want to be publicly visible on the internet. When you create a folder (called something like DCS106) in Cloud9, you are creating a functional subdomain (i.e. yourname.catapult.bates.edu/subdomain) that holds your site. 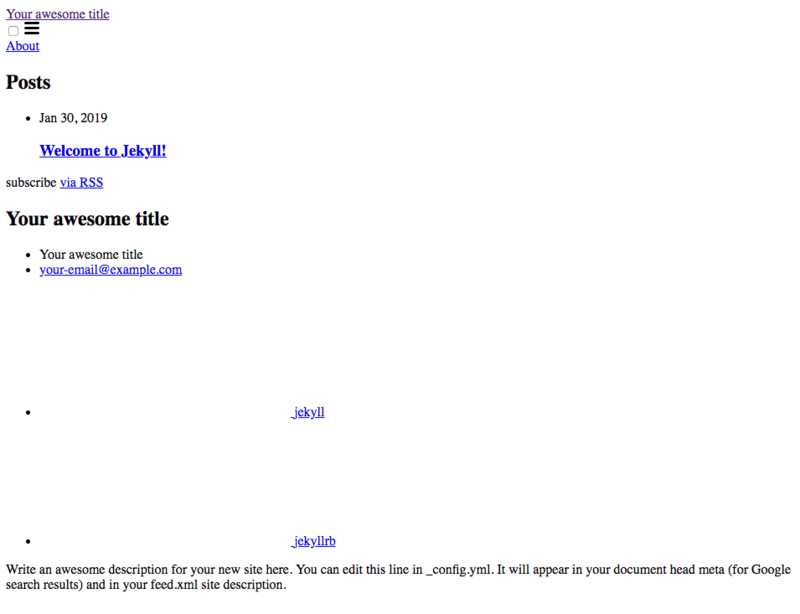 I’ve followed all of the instructions, but my site looks like this! You’re almost there! 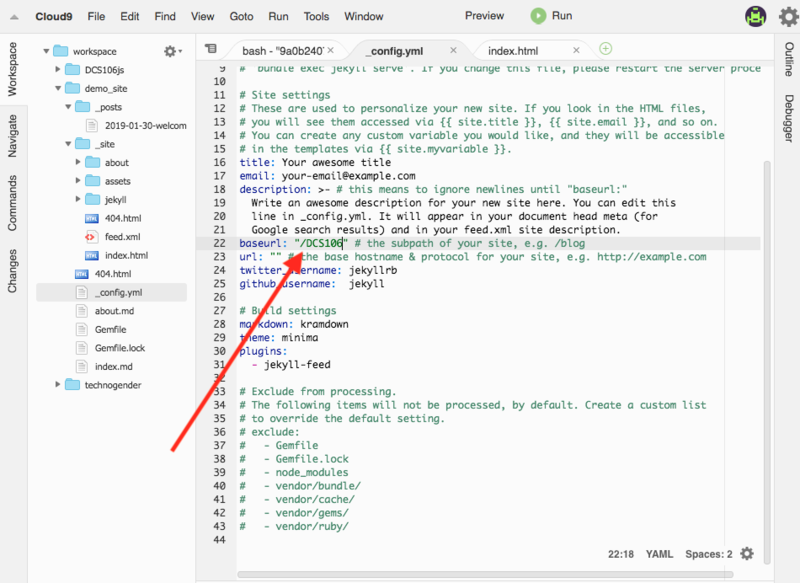 When you make experimental sites in Cloud9, Jekyll does not know where you will ultimately be putting your site. (It does not know about File Manager and public_html). HTML sites work using things called file paths (which work like links). File paths show the route to your files. So, if your blog folder is called DCS106, the file path would be /public_html/DCS106. Basically a file called index.html contains a bunch of links that specify where different parts of the website can be found. It contains information about the title of your site, a link to the styling information (i.e. color, font) and also links the various parts of your website together. Because you are storing your website in a folder called something like DCS106, we need to tell the index.html file that file paths should contain DCS106. Also, because the index file is in the _site folder, it gets re-written every time you save your site in Cloud9. OK. I’ve done all of the right things, and saved my files in Cloud9, but my website doesn’t work! Every time you make changes in Cloud9, you have to follow these steps. Step 4: After I make any changes (adding new posts, for instance), save the files you were working in. Then go to the preview menu, and click on the long URL. Step 5: Once the site looks like you want it to, download the contents of the _site folder, upload them to your blog folder in public_html, and extract the files. What is the deal with posts?